Let’s admit it, buying a used jet ski can be tricky and complicated. This is why I poured everything I know about buying used jet skis into one ebook. I have over 10 years of experience at a dealership selling/buying jet skis, I’ve come across it all and placed it into a PDF ebook to help others along this journey. To demonstrate the value that this ebook gives I’ve given away the first few chapters of it below. There is still much more to read and many other important factors about owning a jet ski in this ebook. The complete copy of the ebook can be bought here, or at the bottom you can learn more. I know I may sound like a broken record, but it is best to avoid 2-Stroke Jet Skis. They’re a dying breed of watercraft, and many lakes banned them for being so polluting. Parts are getting harder to find for them, and many are on their last leg. If all you want is a simple jet ski for the summer that is cheap, then get a 2-Stroke. Just know it won’t last long and is being phased out, but you can find them cheap, and their small hulls are super playful. Instead of a 2-Stroke get a 4-Stroke Jet Ski. 4-Stroke’s are better on gas and don’t need oil added to the gas to run; you just change the oil once a year or so many hours instructed by the manufacturer. How to Tell if you have a 2-Stroke or a 4-Stroke? A 4-Stroke will have a dip stick located on top of the engine (see figure 1). The Dipstick might not be in this exact location unless it’s a Sea-Doo then this will be exactly where it is for all 4-Strokes except the Spark. Another giveaway with Sea-Doo that it’s a 4-Stroke is that it will say 4-Tec somewhere, this one says it on the plastic cover above the Dip Stick. With a clean white rag remove the dipstick and wipe the oil that is on the dipstick onto the white rag. If the oil is black, then go ahead and change it along with the spark plugs too. It is always a good idea to get the oil changed, and spark plugs replaced even if the seller said they did it just to be on the safe side. If the oil is amber in color, then the oil has been changed recently. This is a good sign, and this can be a way to tell if the seller is honest if they said they changed the oil recently. If the oil looks like a melted chocolate milkshake and is runny, then this is very bad. A very runny or chocolate color oil means there is water in the engine and you should walk away from the deal. Don’t forget to check the oil level. Just like a car you have high and low points on the dipstick that shows you the level. You want the oil level to be in the middle. If you don’t see any oil, then it’s either in the hull or was never put in which is very bad. If you see oil in the bottom of the hull, then that is not a good sign. There should be no oil unless it’s a 2-Stroke in the hull of a jet ski. If it’s a 2-Stroke, then the oil tank or lines are leaking. If it’s a 4-Stroke with oil in the hull, then something is not right, and I would avoid it. The battery is the next thing you want to check as it’s common for them to be bad or old when someone is selling there used jet ski. People forget about maintaining the battery and a lot of the times a bad battery is the cause of many problems people run into. The best way to test a battery is with a load tester and not a voltmeter. A voltmeter can lie to you and say the battery has 12 volts, but it’s not voltage that starts a jet ski, but amps and only a load tester will measure the amps correctly. To be honest, you don’t need a load tester at all to see if a battery is good. Simply starting the jet ski out of the water with everyone away from the pump in an open area should be all you need to do. You want to listen to the jet ski start; it should sound strong and spin effortlessly. If the engine sounds like it’s struggling to turn over, then that could be a weak battery or some other issues like a weak starter motor, something in the pump, or as severe as the engine being blown. Another thing you want to check with the battery is its age. You can expect a jet ski battery to last 2 to 3 years if taken care of. Also, the quality of the battery is important too. You have sealed dry batteries, and liquid batteries and the sealed dry batteries are far better. Usually, the stock battery that comes new in jet skis is the cheaper and the not so great liquid battery. A simple way to know if you have a good battery or not is that the cheaper ones will have caps on top of them that can be screwed off. These caps are usually green, yellow, or red in color. See Figure 2, the low-quality battery has caps, and the high-quality batteries don’t have the caps. Somewhere on the battery will be a sticker that is usually round and on the sides. This sticker will have a letter and a number on it. The letter stands for the month, and the number is the year it was made. So if the sticker says “D7”, then it was built in 2017, and this is important to us. If the battery is older than 2 or 3 years, then I would go ahead and replace it. Knowing you should replace the battery can help talk the seller down on price because you can show them the battery is old or getting old and needs to be replaced. If you pay a repair shop to install the battery for you, then don’t forget the cost of labor too. To keep a battery in good shape, I recommend keeping a battery charger or a solar charger on it when you don’t plan on using the jet ski for more than a month. Make sure to get a smart charger that turns on and off when it needs to. If you do get a solar charger stick to 1.5 watts to 2.5 watts to avoid overcharging the battery. The best practice is to install the quick connections that usually come with smart 12-volt chargers and keep the battery on charge when you’re not using it and disconnect at the quick-disconnects before riding. Or keep the solar charger connected all the time and when you go ride store the solar charger in the storage compartment nearest the battery and take it out when you’re done riding to let it charge. A solar charger doesn’t need to be in direct sunlight but does need to be outside the watercraft to work. The reason why jet ski batteries don’t last that long is that we don’t drive them enough. We drive our cars all the time, and it starts every time we get in it. If we did not drive our car for months the battery in it would drain too. A battery charger keeps the battery active and alive, so it’s ready to go when you want to ride. If you ride your jet ski every week or so then you might not need to keep it on charge, but if there are times where you might go a month or more without riding it like in the winter, then you need to get a battery charger. The best way to tell if an engine is blown or good is with a compression test. The way you check the compression is with a compression gauge. Testing the compression might be a more advanced step, and I recommend letting a dealership do it for you instead. When testing compression you want all cylinders to be close to each other and above 100PSI. A supercharged jet ski’s compression will be lower than a non-supercharged model. To give you an example of bad compression – when one or more of the cylinders is 15% lower than the others that is bad. If I have a jet ski with 110PSI on one of the cylinders while the other 2 are around 160PSI, then that is a problem. But if cylinder 1 is at 135PSI, cylinder 2 is at 130PSI, and cylinder 3 is at 135PSI then that is good. When testing compression everyone has their own way of doing it. I like to have all spark plugs out when I test mine. Also, it’s important that all spark plugs are disconnected, and you hold the throttle wide open, and the jet ski is not in the water. If testing the compression sounds too hard then the next best thing to do is take it for a test ride. We talk more about test rides further down. You can expect the average person to put 30 hours on their jet ski a year. When it comes to engine hours, there are two things to worry about, too many hours or not enough hours. If someone has a 2-year-old jet ski with over 400 hours I worry. If someone has an 10-year-old jet ski with only 30 hours on it, I worry. Both cases are not typical, and I worry about what events caused these numbers. Besides those outliers, there are some golden numbers to consider. But those numbers are only good for a quick estimate and don’t mean anything unless you factor in the age of the watercraft. That is why I use this chart (figure 3) to let me compare jet ski hours to the age of the watercraft. The older the jet ski, the more hours I expect it to have. If a jet ski is 5 years old, I expect it to be around 150 hours. If the jet ski is under 150 hours, then that is great, and I move on to checking other factors. If the jet ski is 5 years old with over 150 hours on it, then I get worried depending on how much over it is. If it’s only 20 hours over then no big deal, but if its 50 hours over then I make sure to do a more thorough inspection to ensure everything else is fine. Just like a car, the more hours you have, the more repairs you might have to do. Keep this in mind when looking at older jet skis especially 2-stroke models. When looking at the engine check to see if you see any rust. It would be normal to see some rust especially if the watercraft was used near salt water. It’s when you see a lot of rust or the paint flaking off the engine that it starts to become an issue. Rust equals corrosion, and enough of it will lead to electrical problems in the future. If I see paint from the engine flaking off in clumps, I might not buy the jet ski. It takes a lot of salt and salty water to make paint want to come off anything. The easiest way to tell if a jet ski has been sunk is to see how heavy the seat feels. If the seat is really heavy (feels like you can barely hold it) or is dripping a lot of water, then it’s been sunk. Another way to tell if the seat has water in it is to push on it and you’ll hear the water come out. A sunken jet ski will have problems in the future even more so if it was sunk in salt water. Many jet skis will do fine when the proper steps are taken to get the water out of it but if the seller is not honest about the sinking from the get-go then something is not right. Other signs of a sunken jet ski is the engine compartment will be covered in dirt like in figure 4. This jet ski in figure 4 is the worst case scenario for sinking. If the engine compartment of a jet ski looks this dirty, then run far away. Below is the entire table of contents showing you what you’ll get when you buy and download the ebook. Don’t Buy a 2-Stroke – Learn the differences of a 2-stroke and a 4-stroke jet ski and why you should avoid the 2-strokes. Check Engine Oil – How to check the engine oil and what color and condition to avoid. Check Battery – What type of battery to use and how to determine the age of the battery. An old battery or a bad one could be a great bargaining tool. Compression Test – One of the most important tests you can do to determine if an engine is good or bad and what range you want to be in. Engine Hours – What engine hours really mean and the golden numbers to look for. Check for Rust – Where to check for rust and what to avoid when you see it. Check To See If It’s Been Sunk – What are the signs the jet ski has been sunk and if you should avoid it. Superchargers – What’s the big deal with superchargers and what extra steps you should be doing to make sure a supercharged jet ski is worth it. Check the Pump – Learn what the pump of a jet ski can tell you about the condition of it and how well it was maintained. Check Drain Plugs – Learn where the drain plugs are and if they’re good or bad. Check the Reboarding Ladder – The step or often called reboarding ladder can tell you a lot about how well the craft was taken care of. Check for Damage – An overall check to see what is normal wear and tear and what is major. 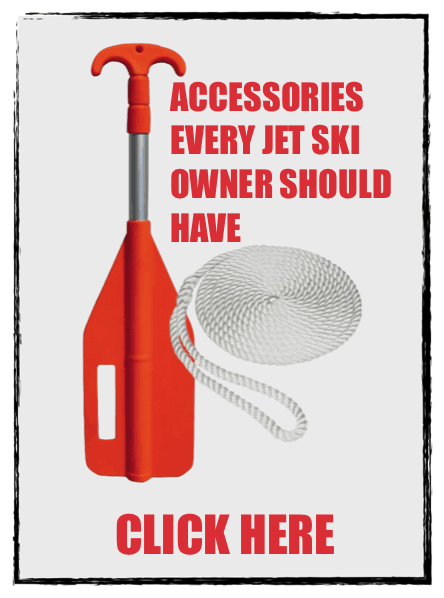 Check the Floor Mats – The floor mats of a jet ski are often overlooked but can tell you a lot about the condition of a watercraft. Check the Seats – Learn what damaged seats look like and what to do about them. You also learn what one major issue is with some seats that tell you not to buy a watercraft. Ask for Service Records – Why service records matter and how best to keep them yourself. Check the Trailer Out – We can’t forget the jet ski trailer. Learn many tips about trailers and what to avoid. Test Ride It – What to look out for when you test ride the watercraft and other tips to watch out for. What Do You Pay – The big question, learn what is fair to pay with an example. Bonus Tips – With 16 bonus tips, you have ones from what dock to get to what not to do when jump-starting a jet ski. To buy the full copy of the Used Jet Ski Buyers Guide Ebook Click Here or click on the “I want this” button below. *Please wait to load below if on a slow connection or click here to view on Gumroad. It’s 34 pages long, about 50 minutes to read, and 14 real images I’ve taken over years to point out what to avoid when buying a used jet ski. 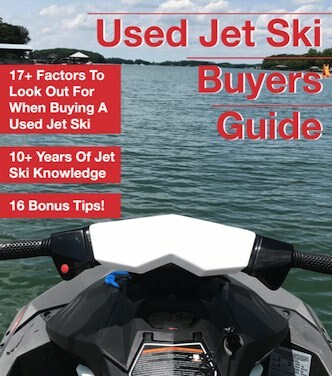 There is a lot of information in this book that took me years to collect from selling and buying used jet skis and even general + helpful jet ski advice too.